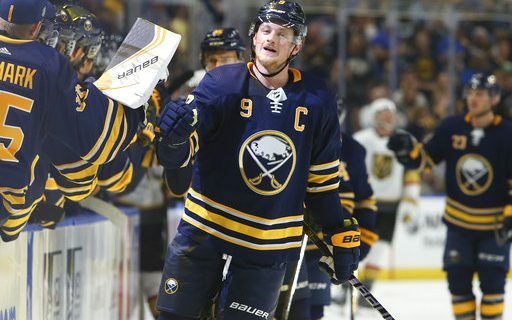 Jack Eichel is off and running in his role as the Sabres new captain. But as sports humorist Jeff Wozer has discovered, those responsibilities go beyond just leading the team and dealing with officials. • Wand WGR’s Paul Hamilton as he enters and exits team locker room. • Call Ryan O’Reilly to see if he knows where the player lounge’s TV remote is. • Serve as judge for team’s annual locker room stall holiday decorating contest. • Drive Sabretooth to vet for monthly distemper shot. • Talk to younger players about the pressures of being designated a Moe’s Hot Player of the Game. • On the first of every month switch the locker room’s Love of Cats wall calendar to the new month. • Make rookies aware of Sizzler’s peach cobbler. • After teammates inadvertently scuff the Zamboni’s hood talk to Zamboni driver about giving them their soccer ball back. • Sit next to Brain Duff on every team flight to reassure him he does not see a gremlin on the jet’s wing. • Has key to locker room’s vending machine in case someone’s candy selection doesn’t drop.